‘I actually have a direct line which I can call Him on and get instructions on how to proceed,’ he has been quoted as saying. 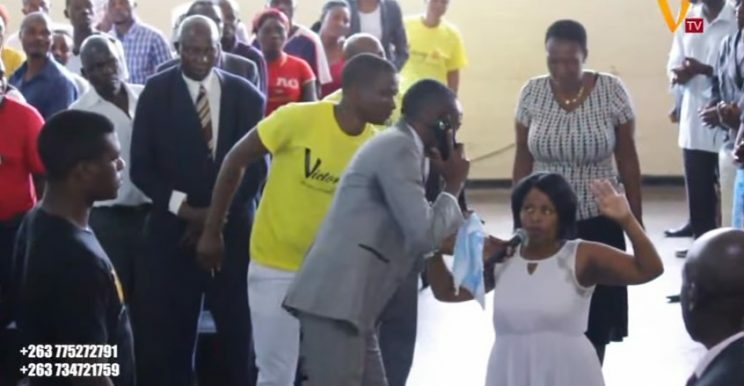 Pastor Paul Sanyangore of Victory World International has claimed to have a direct phone number to heaven, after a video of him talking on the phone during a church service emerged. In the video, the pastor can be seen holding his cellphone and responding to God’s questions, he claims. He calls a woman from the crowd, and as she kneels down, he then starts receiving instructions from “heaven”. “Hello, is this heaven? I have a woman here, what do you have to say about her? Oh … I should ask her who is Sibo,” he asks “heaven”. The woman then responds telling him who the said person is. The woman then tells the pastor that the said children are in Bulawayo. “Heaven in online,” he says. In an interview with Zimbabwean news site H-Metro, the pastor, also known as Pastor Talent, said he did not understand why people were surprised about his actions, further claiming to have a direct number to God. “I have a direct channel, actually I have His number and I can call Him when need arises. It is possible to talk to God; why would you doubt that I got a call from Him? I actually have a direct line which I can call Him on and get instructions on how to proceed. I got this when I was praying and I heard a voice telling me to call direct,” he was quoted as saying. He reportedly said he would make the numbers available to the public when the time was right.